Copyright Notice: © 2018 Wissper Ltd. These are the official Wissper licensed characters, Wissper. Rainbow Productions holds the UK’s official licence to manage the personal appearances of these famous characters at public events on behalf of the brand owner. Wissper is a kind 7 year girl who is able to talk to animals. The animals always go to Wissper for help. She can magically transport herself to anywhere there is an animal in danger by saying the magic word “Sssshhh…” She is very caring of all the animals but she can get cross if they misbehave! Wissper is created by the same animation studio as BAFTA nominated Waybuloo. Broadcast in the UK by Channel 5’s Milkshake. The TV show premiered in the UK on October 12, 2015. 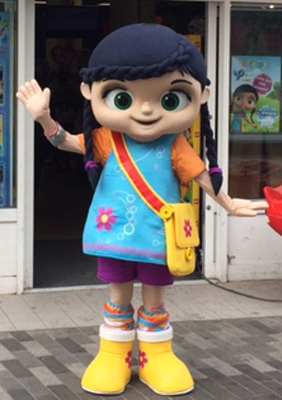 Mascot costume Wissper is available to book to attend UK events.